It’s finally nearing the end of zucchini season. It’s been a big season for zucchini for us, because of the prolific plant in my mom’s garden. That thing has probably been responsible for at least 30lbs of squash this season. These fritters were part of our epic Zuke-fest. I don’t particularly care for raw zucchini, or even fried coins, or grilled squash, so I’m always looking for ways to disguise the zukes in cheese and tomatoes, soups, breading, or other creative forms of destruction. Which is why I turned to fritters. There are myriad zucchini fritter recipes floating around the internet. Mine is a bit of a southwestern take on the item. 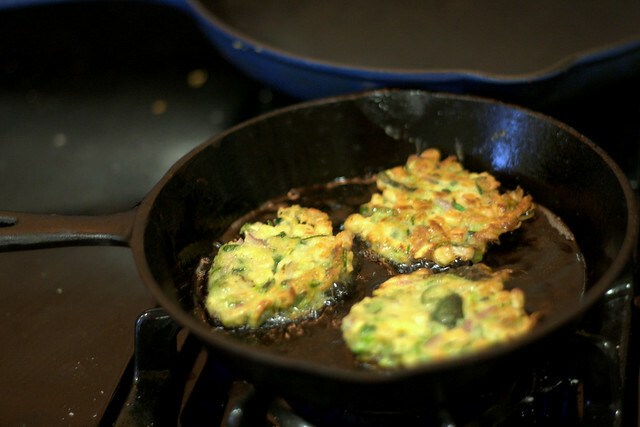 Adding corn brightens up the dense shredded zucchini, and red onion and jalapeno give these a sharper edge than a basic latke-like fritter. A creme fraiche or sour cream garnish adds a creamy, tart finish that feels like summer. The key to crispy ones that fry up nicely and don’t fall apart is leaching the water out of your zucchini first by salting it, so don’t skip that part. Now that it’s finally summer in San Francisco, it’s time to whip out the summer classics, like this. You still have another week or two to procure zucchini and corn before they disappear until next July, so hurry up before they disappear. Adapted loosely from Simply Recipes. 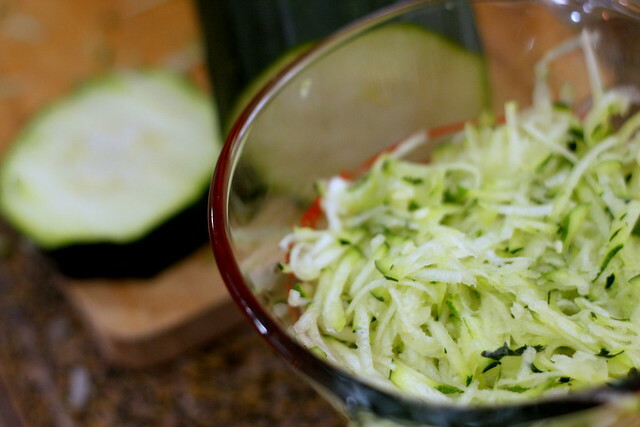 Set grated zucchini in strainer over a bowl or the sink and salt generously. Let sit for at least 10 minutes, then wring out as much water as possible with paper towels or in the strainer. Whisk egg in large bowl, then mix in onion, corn, zucchini, jalapeno, flour, salt, and pepper. Heat oil in a skillet over medium heat. Drop mounds of batter into oil and flatten slightly with the back of a spatula. Flip after 4-6 minutes of cooking, when one side begins to look brown. After a few minutes on the second side, remove from pan to paper towels on a plate. Serve immediately with creme fraiche or sour cream, or keep warm in the oven if necessary.